Years ago Sue Westhues planted a package of gourd seeds with the expectation of having some gourd birdhouses. In reality she planted a whole new career in creating works of art and utilitarian items from gourds. The original seeds yielded about 200 gourds and sparked an interest in Sue to do creative things with them. 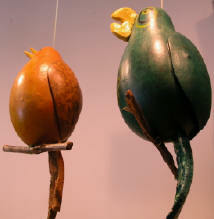 Her gourd creations are now on display at the Brown County Craft Gallery in Nashville, Indiana, year around. 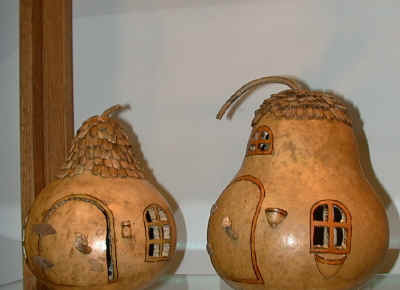 Gourds tend to have unique features and personalities that generate ideas for their use. 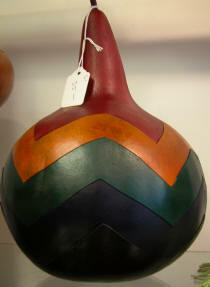 Many varieties of gourds tend to offer infinite possibilities with the sizes, shapes and colors they produce. Sue describes her gourd art as “. . .the most therapeutic and satisfying medium I had ever worked with. They can be painted, carved, etched, dyed, burned, cut, molded, and most practically, used for endless functional purposes.” All of these techniques can be found in the gourd creations that she produces. Gourds can be further enhanced with other natural items such as leather, raffia, and beads. 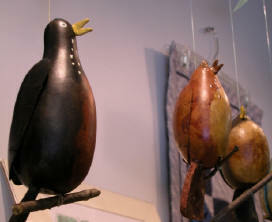 Some of the items featured in the gallery are birds as single birds or groups fashioned into mobiles, decorative birdhouses, primitive musical instruments, purses, dolls, ladles and other unique objects. Sue is a member of the Indiana and American Gourd Societies. She has won several first place awards at Indiana and Ohio Gourd Shows over the years. Her work has also been featured on the Carol Duval Show on the Home Gardening Channel. Three photographs of her work were included in “Making Gourd Musical Instruments” by Jim Widess and Ginger Summit published in 1999 by Sterling Publishing. Sue has taught her gourd drum making craft through the Indiana Gourd Society.